While a lot of businesses are going ‘green’ and paperless, we still live in a world where paper exists, especially in business. And the problem with paper, is it tends to multiply. Or, at least it feels that way. 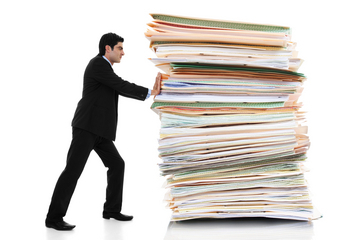 If you are a completely paperless business than bravo to you! It is not easy to become 100% paperless and you probably won’t need this advice, however, if you do still have paper piles taking over your desk, then keep reading. Taking care of the paper piles, will require a mindset shift and daily discipline, as remember, paper tends to keep coming in even after you set yourself up with a organization system. Here are three steps to start the process of managing your paper piles. Will you refer to it again? Is it available somewhere electronically? Do you need to keep it for tax purposes? Will it be worth your time and energy to file? Once you have eliminated the clutter, you will need to organize what is left into a system that works for you. File boxes, tabbed folders and/or file cabinets are all good solutions. Get yourself a label maker and start creating clearly labeled folders. But again, only keep those papers that have been determined to be essential or necessary to store. Shred and recycle the rest. The key to organization is consistency. Every day that you receive mail or if other paper finds its way into your office, you need to deal with it. You need to make a decision of where it will go in your new organization system, or if it needs to be tossed, passed onto someone else or if you need to take action with it. So much of the paper you receive is probably useless. You’ll never look at it again, you’ll never need to reference it, it doesn’t bring you joy, and it takes up a lot of room. So strive to go paperless as much as you possibly can, and then declutter and organize the rest. It will free you from the piles of paper that can overtake your workspace and distract you from other more important tasks in your day. This entry was posted in Blog and tagged clarity, clutter, files, filing, mail, organization, paper, processes, systems, workspace on January 18, 2017 by Assistant Match.